Life sure has a way of intruding on your plans. Paul’s brother Fred dazzled me with anecdotes of his studies in the interior of Bolivia and Peru. He’s an academic, and travelled there to pursue birds. The things that he found, leave you speechless. Birds and butterflies of almost indescribable beauty and mystery. His telling of the dangers that he confronted chastened me, for after the streets of Brooklyn, thank you, I do not want to be one of the poor souls who are in a bus the goes over the side of a cliff, on one of those unimproved mountain roads! Me? I’m very happy to travel here in the U.S.A to more predictable destinations, like this one. Doak field in Raccoon Creek State Park in southwestern Pennsylvania. 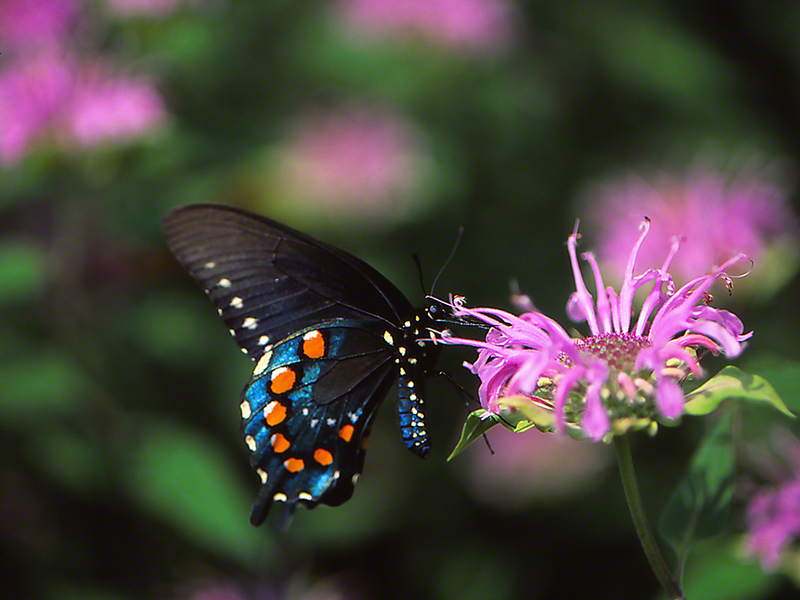 Imagine us there, with Bergamot blooms blanketing this enormous meadow, as a Pipevine swallowtail butterfly floats in. The pipevine is anxious for the rich sugary nectar of the Bergamot. Distracted, I cautiously move in closer, and what I see there, erases my thoughts of Peruvian rain forests, their ferocious mosquitoes, the very real threat of being ambushed/kidnapped ( my son was kidnapped there, and Thank G-d he and Rene were released unharmed ), or caught in the middle of a firefight in Lima, between army and rebels. America is a butterfly magnet, and for good reason. My Fuji slide film shoots color real-time, and this year, I hope to please you with butterflies of much beauty, amidst green foliage that is honest in its share of green.